I'm Going on a Trip... a (Mostly) Wedding Planning Trip! 1. Visit the venue for the first time. I've never seen the venue in person, so I'm a little nervous. I've seen hundreds of photos of the barn during weddings (all of which are beautiful), which helped tremendously to make the choice. My mom and Dave's mom went to tour venues, and in the interest of time, they booked this one. They assured me that this was the best one, but the control freak in me still needs to see it for myself (at least once). 2. Meet with the caterer. Dave and I aren't able to have a tasting before the wedding (the woes of being a long distance planner), so I at least want to have this initial meeting with them. I want to be able to meet them and express to them what we want for our day. 3. Try on some wedding dresses! I have only tried on 2 wedding dresses so far in almost a year of being engaged. But don't worry, my mom has made a bunch of appointments, and I'll have my support group/entourage there. I have an idea of what I want in a dress, but I don't know exactly. There are so many options! 4. DIY. My sister (who is my MOH) and I have a couple of things that we want to work on while I'm home, which may include gold glitter. I'm going to leave it at that. 5. Relax. My busy season for work has just ended, and I need to take a chill pill for a couple of days. I joked with Dave the other day about how I am going to have a drink at the airport, because I think that is the ultimate sign of a vacation. Ah! So much to do!! The venue looks gorgeous. Can't wait to read more! A drink at the airport! Yes, that means a trip has started, for sure! haha! Sounds like it will be a productive yet relaxing week! So good that you have people helping you! Any excuse for travel is good by me! :) Sounds like you've got a great week lined up--good luck with all of the planning! It sounds like this trip is all business and very little pleasure but getaways are always nice. Have fun! Holy WOW! That venue is absolutely gorgeous. I can't wait to hear all about it! Have a great trip. I can't wait to see it! We want something rustic and laid back, so I think this will be perfect! We haven't done much planning really, just little things. I'm excited to really start! It is mostly business, but escaping from work to hang out with my parents and sisters for a little bit is going to be fun! Thanks!! Thanks Meg! I need to remember to take more photos! It's really starting to become real with this! Right! I didn't realize everything that needed to happen until I wrote this list. Crazy! Thanks! I love traveling, so I'm excited to fly. Most of our travelling in the past few years has been to Rochester, but that's alright. I'm excited to see my family! I need to make sure to remember the pics! I am with you sister! Next week I am heading to Minnesota to check out the venue for the first time... and the florist. I am doing a lot of yoga breathing between now and then. My mom and Dave's mom have been SUCH a help. We seriously wouldn't be able to do this from afar without them. I'm looking forward to seeing everyone. :) I don't know why I have that in my head that that means vacation! I didn't even realize that the list was that long until I wrote this! Time to get crackin! Planning long distance stinks! But it will be worth it in the end! Did you book your venue? So exciting!! Have a blast! Your venus looks awesome!!!! Have a fab trip, that dress is waiting for you!!!! I cannot wait!!!! When are you going to look at the barn?? I want to come! :) Cant wait to see your face! Congratulations on your upcoming wedding, looks like it will be an amazing day. Sounds like your going to have a busy but exciting weekend! I can't wait to hear about all of it when you get back. 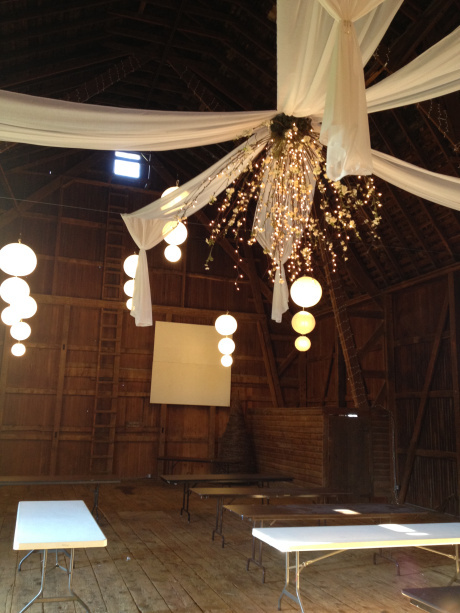 I bet the venue will be beautiful; we are doing a barn as well. And good luck with the caterer. As far as the dress, you'll know when you've found it. Have fun with that!! sounds like an exciting weekend! Hope you're having fun!